After enduring a particularly hard winter, there's no better sight for sore eyes than a lush spring garden. Bringing this spirit of spring renewal into the home was the inspiration behind our latest workshop with our friends from Field. 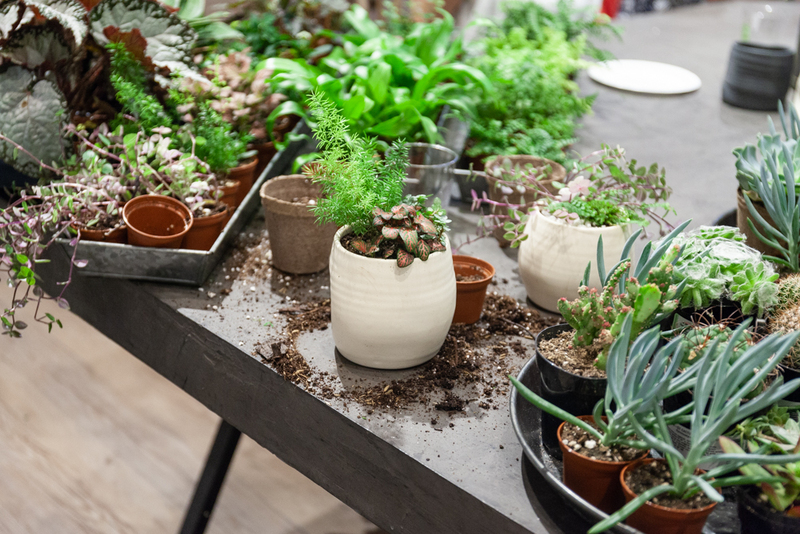 A plant and lifestyle shop based in Fishtown, Field sources beautiful plants and pairs them with limited-edition, handmade planters commissioned from local ceramists. Field has been a favorite spot for a few plant-obsessed Rikumo team members, so we were particularly excited to work alongside founder and owner Erin for this special Sunday workshop. As Erin's team went over the best planting techniques for beginners, we snacked on bowls of fruit and a cheese platter along with refreshing matcha palomas (matcha + grapefruit juice + a little tequila for those at home) made by Sarah, our community coordinator at the store. Guests brought their own planters and picked from a selection of cacti, succulents, plants, and mosses to create their own potted garden. A lot of us got creative and assembled a few plants into beautiful wild arrangements that felt as personal as a bouquet of flowers. Always line the bottom of your pot with a small layer of gravel before beginning to plant. This will create a drainage layer that will provide oxygen to your plant's roots and keep extra soil from coming out the drain when watered. Add your soil of choice to the planter, and push up to the sides to make a pocket. That's the spot into which you will transfer the plant. Take the plant out of its standard-issue plastic container. Gently pull at the plant, taking the soil with it. Massage the plant roots as they emerge, so your plant doesn't go into shock when transferred into its new home. Transfer the plant into the pocket, filling in open spaces with leftover dirt. Be sure to tap the pot when you're done to let the soil settle accordingly. Add a little water to further settle the plant and soil. Set your plants up in a row and observe how long it takes for the soil in each planter to dry out completely. Some plants may need daily drinks of water, some may only need them once a week. Set yourself up with a watering schedule that works for your plants and you'll never overwater or dry them out again. When it's time to water, give each plant a full drink. This is to ensure oxygen gets to the roots, which is the key to thriving stems. Work with your environment: lush, tropical plants cannot thrive in a windowless studio apartment. Low light favors boston ferns, spider plants, and pothos vines, which all have a pleasant lushness that needs little sunlight. Lots of natural light? Cacti, succulents, and fig trees work wonderfully there. If you're potting a prickly cactus, use nitrile-dipped gloves to avoid any stabbing. Leather gloves offer an unpredictable protective barrier, as they are made from animal skin and are as likely to stick to the needles as human hands. Thanks to everyone who joined us! There are a few tickets left for our next event- a lecture and natural indigo dyeing workshop with textile designer Graham Keegan- on June 3rd. Limited seats available- RSVP now to claim your spot!